Crich hill, south-east of Matlock, rises to over 600 ft above the River Derwent, with Crich Stand erect above the quarry face, but in its main lead mining days it was without the great quarry. It is an inlier of limestone about one mile long, with its long axis north-west to south-east, An inlier is an area of older rocks completely surrounded by newer rocks. At Crich the underground beds rise in a dome with the highest part slightly to the southwest, with the beds dipping more steeply on this side. Miners working underground through the hill found the same beds dipping down before them which they had already passed through, and they described it as like going through the skins of an onion. There is a fault down the brook on the west side, which was seen underground when Wakebridge Pipe Vein was worked northwards in rich lead ore. Even this century lumps of ore weighing nearly two hundredweight were mined. In 1828 a cavern was discovered which was estimated to contain 1,000 tons of ore. It was 90 It across and about 50 ft high in an upward dome, the floor being a reversed dome. 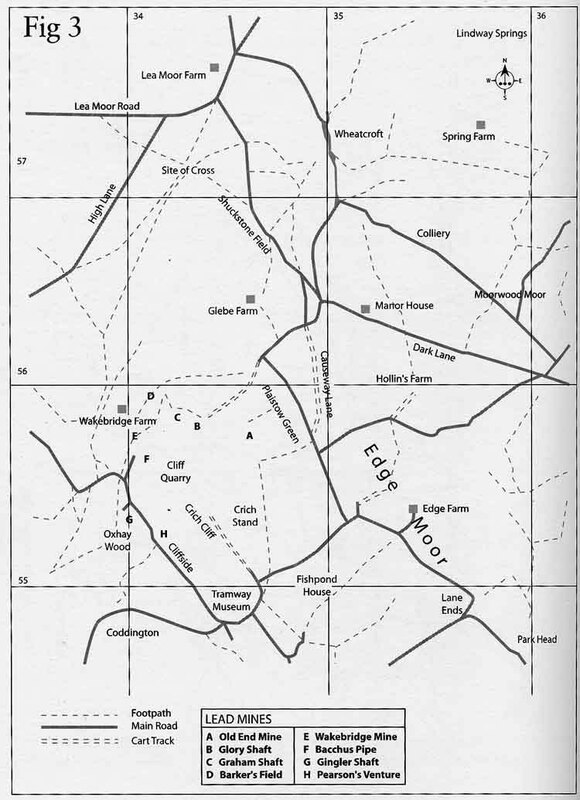 There is also supposed to be a fault along the southern edge, and here Pearsons Venture Mine was on the edge of the limestone, going down to toadstone - the Derbyshire name for igneous rock - at about 420 ft depth. The richest deposits here were beneath the toadstone. With the steeply dipping strata and the faults the contour of the beds appear to have varied from mine to mine, and even from shaft to shaft. Many of the veins were remarkably rich, and contained chambers or caverns with beautiful fluorspar or calcite, and with magnificent masses of galena. From the opening of the nineteenth century fluorspar of special quality was found, by 1811 it was being sent to Butterley furnaces for use in smelting. The veins cross each other in all directions under the hill, and up to some years ago, when walking on the surface, most of them could be traced and fitted with old plans. By now not only has the Quarry destroyed their southern end — although some can be traced in the quarry face — but the surface of the hill has had its features removed by fluorspar working. There were two stoops or posts of stone marking the veins, one of them is referred to in documents. It used to be a lonely hill with grass on the mounds of the mines, and the ground scattered with shafts, while pieces of lead ore, purple and yellow fluorspar, and calcite clear enough to show double refraction, could be picked up. Some of the veins have fascinating names — Pigtrough, Leather Ears, Wanton Legs, Merry Bird, and Silver Eye. Bacchus Pipe and Pearsons Venture were particularly rich, as were Wakebridge, Glory, and Old End. On both sides of the hill, whenever the mine workings came down practically to sea level, the vein contracted or became poorer in galena. As with almost the whole of the lead mining field of Derbyshire, directly the miners began to deepen their mines, water became a major problem. Water-wheels were impossible on the dry uplands, while hand-pumps and rag-and-chain pumps only lifted for short heights. Raising water in buckets by horse-gin was expensive and slow, so the driving of soughs, or draining levels, was extensive. There is a reference to an early sough at Crich, in a lease of 1658 between the lords of the Manor of Crich and John Newton and others called "'partners for the carrying on the great sough and grooves within the- said manor." l This is too early for the three known soughs, and no further reference to it has appeared, but so early a level would not be a long one driven from a distance. The likeliest mines to unwater would be on Crich Cliff and the most logical place for it to be driven from would be the brook in Oxhay Wood. At the junction of a subsidiary stream a 'well' is marked on maps. In Derbyshire limestone country this word almost always indicates a spring and a stone trough. A true well is called a bucket-well. This is in line with a pump in the middle of a field which was used for lifting water for cattle. An Oxhay level is mentioned In 1740. Hollins Sough was successful and enabled the miners to continue with their work at greater depth for several years until they were again obstructed with water and had to drive another sough at a much lower contour. This was begun at Fritchley, on the south of Crich. It was driven by the owners of Old End Mine, and took many years to complete, and cost them, as they said, 'an enormous amount of money'. The entrance to the sough is on the east side of the brook, with a small, typical, arch, 2 Ft to 3ft high and 1 ft 6 in wide, with a stone-flagged floor. The arch, and the lining, are of gritstone. When examined a number of years ago there was a steady flow of clear water. The date 1753 is cut on the facing of the arch. In 1953 two explorers decided to celebrate the double centenary by exploring the sough. At first the gritstone arched part was very restricted, with a good depth of silt and 6 in of water, but after a short distance it widened, then narrowed again, repeating this at intervals, the wider parts being driven through unlined shale for long stretches. After about half a mile the air was bad, their carbide lamps would hardly burn and a candle would not light, so they retreated. The sough agreement of 1953 was made between the Earl of Thanet and about a dozen Adventurers who were partners in the proposed sough. Nearly half of them were from Nottingham and London, for business men outside Derbyshire quite often 'adventured' their money in the soughs. There were also Derbyshire gentlemen including Francis Hurt, lead merchant and smelter, and Peter Nightingale, lead merchant, who was the landowner of Wakebridge. A considerable part of the duties on lead ore raised within the manor of Crich belonged to the Earl of Thanet, and by this agreement, in consideration of these, the Earl gave the soughers liberty to drive it beneath his land. It was to be driven for the discovering and unwatering of several veins within the manor, including veins on the east of the church. This agreement calls it Crich Sough, as it was in 1815, when it was stated to have been driven two miles in shale and limestone, by 1837 it was called Fritchley Sough, and is now known by this name. It is not shown on any mine-map as going further than a short distance beyond Old End Mine. Here the ruins of the engine house still Stand above the shaft. It is built of hard greyish gritstone, the stones roughly shaped and partly coursed, it dates to the 1850's. The shaft could be seen to be well made, oval in shape, lined at the tope with gritstone. The mine, known locally as T'Owd End, was one of the deepest in Derbyshire, finally reaching the depth of 912 ft. toadstone was cut in the shaft at about 260 ft. The gangue was fluorspar above the toadstone, and calcite below it, the richest galena being below the toadstone. In 1862-3 Old End was one of the mines being worked by Wass & Co., and the reckonings show varied profits and losses, once there was £1,800 worth of ore at a reckoning of either six or seven weeks.5 By 1868 the deeper the mine was sunk, the more the yield diminished, so they ceased to pump, and in that year the machinery and pumping plant were put up for sale. Glory Mine shaft is on the south side of Great Rake, north-west of Old End. Various depths are given for the toadstone at Glory, but an old section of the mine shows it at about 220 ft, finally this mine was worked to 810 ft when the vein became impoverished. During the 1950's when a great amount of fluorspar was being removed from the surface, some mining was done underground and fishbellied rails were found. In 1831 a quarrel arose between the miners of Old End and those of Glory Mine. The latter sank Graham Shaft, and drove eastwards for about 300 ft, then sank Glory Shaft. Their vein was freed by the Barmaster and given to them, and was named Glory Vein. They erected a horse-gin on Glory Shaft for winding up their ore. The last part of the shaft was sunk through about 60 ft of toadstone, and beneath it they found a very rich vein. In opposition the Old End miners believed that Glory Vein was really Great Rake which belonged to them, and which they were working above the toad stone. A plan and section drawn on behalf of Glory Mine shows that Old End drove a cross-cut from their Great Rake horizontally through the toadstone which here dipped between the two mines. Where they left Great Rake they were accused of "artfully fixing Stones and Clay. . . to deceive Independent Inspectors" i.e. pretending that they were following their vein, and not driving a cross-cut through solid rock to intersect another's vein. When they were through the toadstone they continued driving westward beneath the dome of toadstone until the two parties met, the Old End miners being lower than the Glory miners, which placed the former "in danger by being 10 yards lower in the vein". The old section shows drawings of miners in Glory's higher level pushing stones down the drop onto miners below them.6 An account of the dispute says that it "led to a violent contest between the parties and much physical violence was resorted to" which nearly ended in loss of life. It is said that one side burnt old boots underground to try to smoke the others out. The place where they met is referred to as the Thurling. A thurl or thurling was a short connecting passage made between two drives as a connection for some purpose. In another lead mine, during troubles in 1825, the contending miners were said to have "thurled or holed together" so the word appears to have taken on this meaning in Derbyshire lead mining. The small drawings of miners on the section show some' of them, using picks to mine ore, with some pushing small waggons with two solid wheels on each side. In both sets of miners, one of them is leaning contemplatively on his spade. The Glory miners said that Great Rake was narrower by as much as fifteen to one at the widest part of their Glory vein which was 15 ft wide, and that Great Rake was entirely outside or above the toadstone, and Glory New Vein entirely inside or below the toadstone, which continued downward very deeply. In September 1831, proceedings were taken against William Frost and Thomas Boden of Glory Mine, with a verdict in favour of Old End Mine. The Glory miners ignored the verdict, and continued working their vein, so Old End took their case to the Chancery Court of the Duchy of Lancaster which was the court of appeal for Derbyshire lead miners. This court refused them an injunction, principally on the ground of want of sufficient proof that the upper vein Great Rake, and the lower vein called Glory, were the same vein. Finally the parties came to an agreement, and the disputed ground was divided by a boundary line fixed on the surface by two Stone posts. Only one of these stones is still visible, near Old End engine house. It is roughly dressed, has "I.A." on one side, and "S.P." on the other. The Lordship and Liberty of Crich is a Private Liberty, which means that the laws and customs were apart from those of the King's Field, which was the main part of the Derbyshire lead mining area, although the laws were similar. The complete manor had belonged to the Earl of Shrewsbury, and was divided among his descendants, while Wakebridge was a separate manor. As with much of the Derbyshire lead mining field, in the manor of Crich the ownership of the land was apart from ownership of lead mining rights. As the Memoranda of the Mines in 1837 states "the system is so ancient that the Mines have long been looked upon and treated as a separate and distinct property from the land." In many districts the duties belonged to the Lord, or Lords, of the Manor, although they could be leased out or transferred. In Crich 2/3rds of the duties, which had belonged to the Countess of Arundel, had become parcelled out among numerous proprietors, many of whom were also landowners, and who received proportions of the duties according to their shares. By the nineteenth century the other 1/3rd belonged to the Earl of Thanet, and the Dukes of Devonshire and Buckingham. From time immemorial it had been the custom in the manor for persons to search for and raise lead ore from the mines "on rendering duties to the Lords and Owners thereof". By the seventeenth century the duty of lot was 1/9th of ore, cleaned and made merchantable, and cope of 6d. a load which latter was paid by the buyer of the ore, and which was held to be paid "for the privilege of free egress to the Mine for the purpose of carrying Ore away". The measuring Dish was the same as the Wirksworth Dish, of approximately 14 Winchester pints. There was a Steward and a Barmaster, but no Barmote Court, therefore no Jury, or what was called the Twenty-four. Disputes were settled in the Court Leet and Court Baron. In cases of dispute the Steward appointed a hearing, and statements of the opposing parties and their witnesses under oath were given in open court, and the Barmaster's Book was accepted as evidence. In the course of a few days the Steward gave his judgement by the mineral laws of Crich, and his decision was final. The Barmaster attended at the mines when the ore was measured, and received lot and cope, paying this over once or twice a year. He transferred ownership of the mines and allotted meers, or lengths of the veins, entering them in the Barmaster's Book. Largely the mines were on the uncultivated land called the Cliff. Formerly it was common land which was enclosed in 1788. In the rest of enclosed land the miner could not dig for ore without the consent of the owner and tenant of the land, "unless the miner can bring a vein along with him off the common," or unless there were already old mining works, and then the Barmaster could give permission to mine. The owner or tenant was to have 1/3rd or 1/6th of the ore. Crosses and holes to mark a new discovery could stand for three days while the miner informed the Barmaster. If the mine was left unworked for six weeks and someone claimed it, the Barmaster nicked it three weeks together, and then in four days he could give it away to a claimant unless the former owner began to work it again. The Barmaster had the right to go down any shaft and examine the mine and could dial any man's ground. In this liberty the meer was 30 yards long. For a new vein the miner must give one Freeing Dish of ore to the Barmaster, who then allowed him two meers, one on each side of the shaft. The Lords Meer was half a meer at the end of the Founder Meers. Then the miner could have as many taker Meers as he wished, paying one Dish for each meer. If it was an old vein he had half a meer on each side of the shaft for one Dish of ore, and there was no Lords Meer. The custom of Quarter Cord — measurement of ground allotted for coes, hillocks, and dressing the ore — did not exist in Crich, but the Barmaster gave the miner a reasonable amount of ground for these. By the custom the owners of a mine were liable for all loss and damage arising from people or cattle falling down the shafts. So far as a new mine was concerned "so long as the proprietors of a Mine are using their best means in relieving a Mine from water, such as joining in the driving of a sough, or putting down a mine engine, although the Mine is not in any shaft worked, if the mine be properly stoced" it could not be given away. Stoced is a reference to the possession stowes, small models of the stowes, or handwinch, which were erected at the end of each meer to denote Possession of title. The miner had absolute Inheritance in his mine, subject to his rendering of the duties. Regarding the draining of the mines on the south and west of the hill, Ridgeway Sough was begun in 1803, being driven from the east bank of the River Derwent, about 1,800 ft upstream from Whatstandwell Bridge. It is Ridgeway Sough in documents and on plans, but in 1815 it is referred to as Wakebridge level, and now is generally called Whatstandwell level. Originally it would have had an arched entrance, but now the outlet is a pipe in the river bank at what used to be a steam joinery. At one time the water from the sough worked a water-wheel, and later a turbine for a saw mill. Earlier this century, when an attempt was made to clear the sough, it was described as being about 6 ft high. It was lined with stone for some way and then the sides were of hard shale. There was a blockage where quarry stones had been thrown down a shaft, and the air was bad, so they had to leave it uncleared. The water from the sough is still warm sometimes, it was 64°F when I tested it, but it can change from warm to tepid in a few hours. The warm water came from the mines on Crich Cliff, and was described a hundred years ago as being of "the warmth of new milk". The Crich Cliff mines are reputed to have been particularly warm to work in, while the water coming from Wakebridge Mine was cold. There was a steady flow in fairly dry weather, and the water was very clear. Large quarries are over the first part, but further on occasional shaft-mounds can be seen, no doubt ventilation shafts. It was driven in shale for about 3,000 ft to the limestone junction which ranges along the south side of the road to Crich, after this it winds and twists, no doubt like many other soughs following the shale-limestone boundary. The sough was what was called a standing-level, that is one in which a certain depth is retained for boats, coal is said to have been boated to an engine at the bottom of Gingler (or Jingler, or Rolley) Shaft, later this shaft was for drawing, but there used to be two chimneys there. Extensive ore-dressing was carried on in Oxhay Wood, using the water of the brook. The short east branch of the sough appears to confirm the statement that it was originally planned to drain the Crich Cliff Mines. Wakebridge beam engine was made in 1857 by Thornwill and Warham, Burton-on-Trent, and started work in 1858. Quoting from A. Richards, Mill Close engineman,8 it had a 60 in cylinder, with indoors stroke of 8 ft outdoor stroke 7 ft 6 in. a cast-iron double plate bob was connected to the piston rod by double main loops. The arbors in the bottom chamber, and the gear, were similar to those of the Harvey engine at Mill Close when it was first installed. He states that it was moved from Wakebridge and re-erected at Mill Close Mine in 1889. L. C. Stukey, Mill Close manager, says 1891. The Wakebridge ledger shows that they were making a reservoir in 1856, some men being paid 2/6 a day, others 1/- Sawing the pump rods cost £3 5s 0d, and in 1856 James Else, the mine agent, went to Hull to select pitch pine and memel baulks for spring-beams, sheer legs, and pump rods, Memel was Scots Pine imported from Memel, a port of Prussia. In 1858 they gave "ale and refreshments to the men on Starting the Engine". Buckets and clacks were changed about every six or seven weeks, and the buckets were stitched fairly regularly. Coal was a large item, at times they spent £60 a month on it. Depths given for the shaft are not very satisfactory, that of 420 ft down to the sough, given in Geological Memoirs and elsewhere, do not seem to be possible. Either the sough would be at too low a contour, or the shaft collar be higher than Ordnance Survey contour lines, and it does not agree with comparative heights and depths given in 1835.9 Mr. Barker, who was an engineman at Wakebridge, and lived in a house opposite the mine which had been The Miners Hack Inn, said that the depth was 372 ft down to the sough. A study of the old ledger reveals many items of interest. Some of the buildings of the mine were thatched as late as 1870, thatching being quite common on Derbyshire lead mines. As was usual on a larger mine, a blacksmith did a good deal of work, for little was bought readymade. Miners were paid 2/6 for a shift of eight hours, and lads 1/6 a day, the carpenter had 3/6, and by the end of 1857 he had 4/- a day. The two enginemen were each paid 4/- a day, and worked a six day week. The engineers were paid by the week, the labourers by the day. James Else, the agent, was paid £55 a year, and once £10 was spent on a desk for him. Driving in 1874 was from £2 a fathom to £6, rarely up to £12. A signal bell and galvanised wire for it cost £2, payments for ale and bread and cheese were as much as £3 a time, "refreshments" occur in nearly every set of entries, and there are a number for the Miners' Holiday. Spades cost 3/- each, while a lightning conductor was fixed for £7 12 0. In 1861 there was an accident, for surgeons attended a miner and amputated his arm for £10 10 0. The entry for a coffin for him gives a tragic end to this, The same year a farmer was paid £10 for a cow which fell down the shaft. Long Gate — gate is the word used for passages — started at the shaft and was a few yards higher than the sough, this was the drawing level and followed the vein northwards. In about 1,200 ft Long Gate turned eastwards along Great Rake. There is a good description of a descent down Wakebridge Mine which was written by the Derbyshire geologist Arnold Bemrose in 1892.10 By then the shaft had a total depth of 600 ft. They descended down to Long Gate by nearly vertical ladders with iron rungs, being fastened to the sides of the shaft, with small landing stages of wood at the foot of some of them. A narrow line of rails ran for a total of 3,000 ft along Long Gate to the forefield. The waggons were small and narrow, with candles stuck on the front, Bemrose knelt in a waggon, keeping his elbows close to his sides and his head down, while a miner pushed him along. In 1828 a visitor to Pearsons Venture Mine wrote a similar description.11 He changed into miner's clothes of flannel and bed-ticking, their texture being only dimly visible through the clay with which they were covered, and he was lent a flannel cap. He climbed down the shaft mainly on stemples, these were pieces of wood which were fixed about a yard apart on the sides of the shaft, so that his legs straddled the narrow shaft as he descended. There was a landing place about 120 ft down where he crawled through a hole into a level, then through a further hole to another shaft with stemples. These were sticky with clay, and were of irregular sizes, set at varying distances, and some were nearly worn through, while others felt loose and rotten. At the bottom they went into Ridgeway Sough until they could see along it for about 3,000 ft in a straight line with daylight at the far end "like a large star." In Long Gate at Wakebridge, Bemrose passed through the beds of the Crich dome, first through massive limestone which dipped 45º west, and which contained beds of clay, one of these being red with oxide of iron. Occasionally they passed loose patches in the walls or roof where the gate was lined with stone, or propped with timber, where they came to the junction of limestone with toadstone. Here numerous veins of calcite crossed the gate in all directions, passing downwards into hard rock, then they went into softer greenish coloured rock which was separated from the limestone by several bands of clay containing selenite. In this mine they called the dark coloured rock blackstone, and used the word toadstone for the part of it which had decomposed into clay. In most of the Derbyshire mining area the word toadstone is used both for the clay and the rock. Bemrose states that here the so-called toadstone was decomposed olivine-dolerite, with much-altered felspar, and with pyrites occurring in it. The upper parts of toadstone beds, of hard rock, here called blackstone, were within a few yards of the limestone above it, and were traversed by veins of calcite and haematite, this was the toadstone in which they were mining galena. He describes passing through the Crich dome as being like a "series of pie dishes without any rims, fitting one into another" the whole series being inverted, so that as he and the miners proceeded along the gate they passed through successive beds from the outer to the innermost, and having reached the centre they then passed through the opposite side of them but in reverse order. with much iron pyrites in the vein and in the rock, so that sparks flew off when it was struck with a hammer. Some years later the work had to cease because they were getting to the top of the ore-bearing bed, and were afraid of water getting into the mine if they cut further through the impervious toadstone. On the surface a miner's coe, or coestead, was a small building where there was a good fire, and their clothes were hung up. They worked a six hour shift, changing over at noon, midnight, and 6 a.m. and 6 p.m., finishing the week's work at noon Saturday. I was put in touch with Mr. Marshall who was born in 1874, and had worked at Wakebridge for about eighteen months when he was a boy of sixteen. He was the boy to the men at the ore-dressing floor and was paid 10/- a week. At this period many of the old methods of dressing were still in use, and he gave a vivid description of them. The ore was drawn up to the surface mostly in smallish pieces and taken to the picking-table, which was a flat sheet of iron at one end of which was the fat or vat, and at the other end were three numbered wiskets, or baskets, into which the ore —was thrown, according to the size of the pieces. The deads — stony matter without ore were thrown into a wheelbarrow to be wheeled away to the hillocks. On the picking-table they did the sorting with a right-angled implement about as long as a small table knife. Then they riddled the ore and washed it in a square pan, which was the standing-buddle, with water rushing in at one end. Three men and the boy worked on the dressing floor. This of course is late in date, but for many centuries women and children did the dressing of the ore. In earlier times, and still on smaller mines, the ore was broken by a bucker, a flat piece of iron with a slanting handle. But at Wakebridge in the 1880's the winding engine worked mechanical crushers which had two sets of rollers, the top ones ribbed, with flat rollers below, which crushed the ore very finely, After crushing, the ore was washed again in three vats, by jigging it with what they called the water-pole. The vat was nearly filled with water, and the mixed ore and spar etc were put in a riddle which was attached to one end of this long pole. The other end of it rested on a man or boy's shoulder, and was jigged up and down, this was also called hotching or hutching. The lighter substances, as they rose to the top of the water were skimmed off with a limp, a flat piece of tin or iron. At this mine, the reckoning, when the ore was measured, was six or seven weeks alternatively, and, as was the custom, at the reckoning the miners bargained as to the length of vein which they could work, and for how much per load. When frost or bad weather stopped the dressing on the surface, or in the first two weeks of a reckoning when the miners started their bargain-work and were drilling, so that nothing was being raised to the surface, the three men and the boy had no work, so they went underground to help the miners. Equally, when the ore-dressing was rushed, sometimes the miners came up to the surface to help. This sensible sharing of work can be noted in eighteenth century documents. At the measuring of the ore at Wakebridge, when the Dish was full it was smoothed by the hand, but, unlike earlier times, it was also weighed at 60 lb a Dish. Every so often when a Dish was being smoothed there would be a cry of "Up", and it had to go on the scales, this being done at random. In 1837 it was said that Bacchus Pipe Mine and others here had been the most productive in the country for many years, the ore being mainly in rich pipe veins, which are cavern systems filled with lead ore. At Crich the gangue mineral above the toadstone is mainly fluorspar, with calcite below. The fluorspar is in a wide range of colour, from yellow to pale amethyst to almost black. Among other minerals is barite, both white and pinkish in colour; a specimen of langite, a rare ore of copper, has been found. Also there was haematite and red ochre. The galena at Glory Mine is a very bright shining blue. In a ledger of 1859 an entry shows that Pearsons Venture was still owing payment of £270 to Thornwill and Warham for an engine — Wass was then leasing Wake-bridge, Glory, and Pearsons Venture. Through the 1850's they were getting a lot of ore, and making profits, and were still paying composition to Ridgeway Sough. 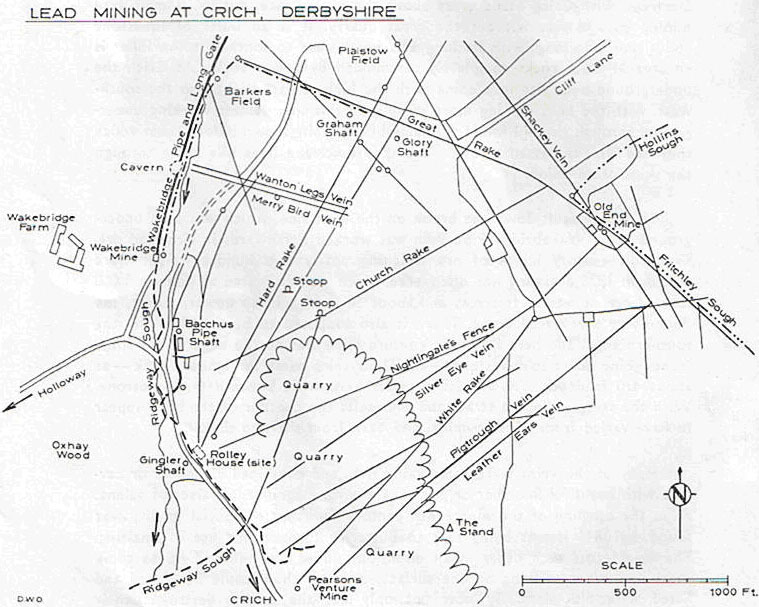 The Victoria County History of Derbyshire, referring to the Domesday Book entry of "one plumbaria in Crich" translates this as "one lead mine", but in another reference it interprets plumbaria as "lead works", It seemed peculiar that there should be only five lead mines in the whole of the county in 1066, so I asked a research worker at the British Museum to check on the exact translation, she took it to a latin expert who said that strictly the translation was "lead works", but from the fiscal point of view of the Domesday scribe this would probably cover smelting as well as mines. One could suggest that the entries refer to areas of mining, not to one mine or only to smelting. In Derbyshire the duty of lot was paid on ore at the mines, never on smelted lead. In Exchequer Depositions of 1657 it was deposed that large quantities of lead ore had been found on Crich Cliff, but no tithe of lead ore had ever been demanded or paid, at that date the Crich miners paid 1/9th as lot, and 1/8th in Wakebridge Manor. Besides thick vegetation on the lower part of the Cliff, and excavating for fluorspar over most of the hilltop, added to quarrying, there is another difficulty in field-work, and that is landslip. The present road to Crich runs over part of it. Rolley House was swept away. It is said that two old ladies lived there and that they "went out of the front door as the landslip came in at the back door," The great landslip was in 1882, there had been one in 1881 further back on the quarry face, the great slip was due to massive and thickly bedded limestone sliding on a clay bed which dipped with the limestone. There was a landslip near Crich Stand in 1910, when hundreds of thousands of tons crashed down into the quarry below. The Stand was first erected as a wooden structure, then in 1788 Francis Hurt rebuilt it as a stone conical tower with a wood platform at the top, this was in ruins by 1843, and dismantled six years later, subsequently being rebuilt as a round stone tower, which was struck by lightning in 1908. The present one was built in 1923 as a memorial to the Sherwood Foresters in World War I. Apart from lead mining, mention should be made of William Brunton, who left the Soho Works in 1809 to go to Butterley Ironworks. In 1813 he was granted a patent for a Mechanical Traveller or Propeller, which was tried out at Bullbridge limeworks, about a quarter of a mile from Fritchley. This machine was worked by steam at 40-45 lb pressure, and drew trams carrying limestone. The tram wheels ran on rails, with legs or propellers stepping on the ground, it's step was 26 in long, moving at 2½ miles an hour. There were two mineral tramways at Crich. The first one, on the east side, was from old Hilts Quarry, and was constructed in 1793. William Jessop and Benjamin Outram were the engineers. A branch to new Hilts Quarry was made in 1850, becoming joined as one tramway through Fritchley to Bullbridge. Its gauge was 3 ft 10 in. and it was on this one that the Mechanical Traveller was used successfully for some while. The tramway closed in 1935. The second tramway was from Crich (Cliff Quarry down the west side of Crich, to Bullbridge. George Stevenson superintended its construction, he lived in Crich at the time. Originally it commenced at Church Quarry, and was made by the Clay Cross Company and was two and a half miles long with two inclined planes with wire ropes. One incline, 1,500 ft long with a gradient of 1 in 10, was called The Steep, and had a winding drum on a vertical axle, this remained in use for a hundred and sixteen years, until 1957. Steam locomotion on the tramway was in use from 1880-1956.14 Now Crich Cliff Quarry is the headquarters of the Tramway Museum. The late Mr. W. Barber; Mr. Michael Brooke-Taylor; Mr. Eric Fisher; Dr. T. D. Ford. B.Sc.. Ph.D., F.G.S. ; Mr. J. Gibbons; Mr. B. Marshall: Mr. John Mort, Barmaster; Mr. F. Sheen; the late Miss P. Shield; Mr. V. Stevensen; Mr. C. Waterfall; the late Mr. A. Watkins; Mr. B. Wheatley; Mr. T. Wragg. M.B.E.. T.D. With acknowledgement to Derbyshire Miscellany Vol. I No. 6 1957 in which a short article on Ridgeway sough appeared. 1. Glover. S. History and Gazetteer of the County of Derby. Vol. 11. 1833. Richardson 1837. Lent to me by Mr. John Mort. Barmaster. 3. Plan of Fritchley Sough 1762. Devonshire Collections. Chatsworth. 6. Plan and Section lent to me by Mr. E. Fisher. 7. Richardson ibid, Glover ibid ll. p. 316. 8. Bulletin Peak District Mines Historical Society. Vol. 2. Part 2. 1963. p. 85. 9. Comparative levels on Crich Cliff. 1835. Journal XVI. 1894. pp. 44-51. 13. Various references, the main one, Victoria County History of Derbyshire. Stevenson's Mineral Line. Derbyshire Miscellany Vol. LV. No. 1 1967. Garlic. S. l.. Further Notes on Crich. Ibid Vol. III No. 8. 1966. Plan of Fritchley Sough 1762. Plan of Veins on Crich Cliff with the line of Ridgeway Sough 1833. Plan of Wakebridge Mine and Cavern. Hard Rake and Ward Vein. Plan of Veins on Crich Cliff (Old End and Glory) 1831. Section of Thos. Lees Shaft and Wards Vein and Hard Rake. l831. Plan of Sundry Veins on Crich Cliff 1831. Comparative levels on Crich Cliff, 1835. Dialling of Veins belonging to Barker and Plaistow Fields. Section of Glory Mine etc (untitled) not dated but is c. 1830. 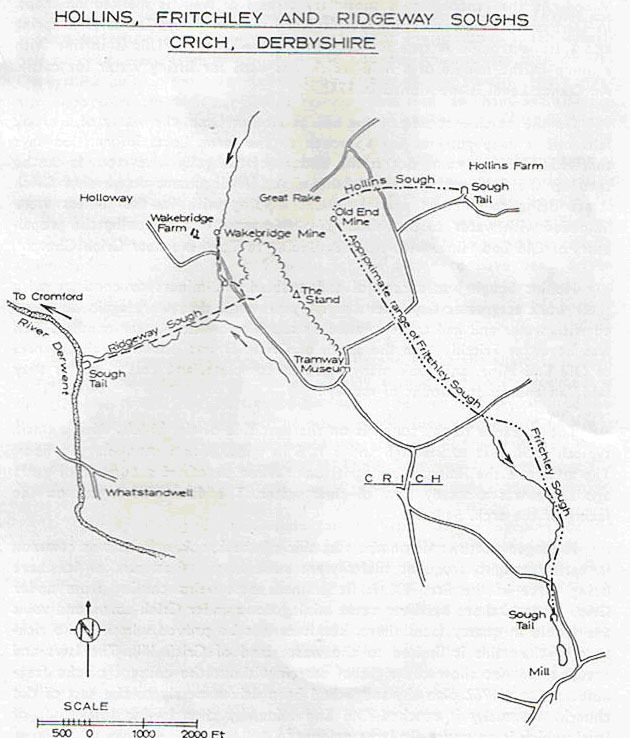 Plan of parts of Crich Cliff, Barkersfield etc. 1834. Diallings of Glory and Old End Mines 1836. Ditto in MS. of White Watson. 1811, given to me by Dr. Trevor Ford. From Dr J. G. Dawes book "A History of Crich"
The photo of Old End lead mine and the map have been reproduced with permission.